Have fun in the sun and see some of the best parts of the East Coast with this amazing 5 day package with Pippies and Powerplay! Try driving on the beach for a unique driving experience! Powerplay and Pippies 5 day, 4 night package is a great way to experience two of the best parts of Australia! You can sail away into the Whitsundays and also cruise along the beach of Fraser Island with this awesome package deal. This combo package will allow you to see all the best parts of both the Whitsundays and Fraser Island - the world's largest sand island! 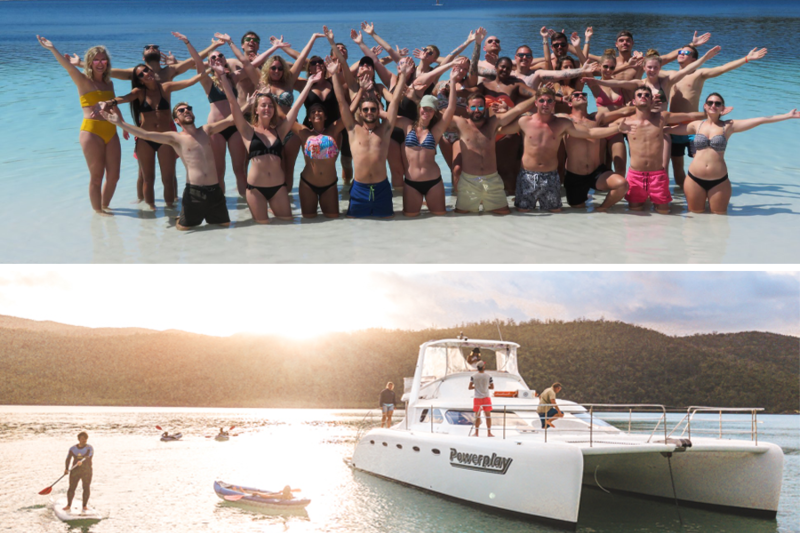 Powerplay is one of the funnest boats in the Whitsundays, with all the extra perks! Cruise through the stunning Whitsunday waters on board a comfortable, spacious catamaran with 17 other guests and experience one of the most unforgettable tours of the Whitsundays! Your knowledgeable crew will make sure you have great time on the water, with a packed itinerary that is guaranteed to show you the adventure of a lifetime, fun-filled evenings, access to the best water toys, and of course a stop at the world-famous Whitehaven Beach! Aft blue lights, which are great for attracting marine life at night! During your time with Powerplay, you can look forward to full-time entertainment with your fun crew as well as a stop to Whitehaven Beach and Hill Inlet Lookout. Your 2 day tour will also allow for several snorkelling opportunities where you will be able to immerse yourself in the warm blue waters to be greeted by the unique marine life that awaits below! This unforgettable tour is suitable for 18-35 year olds, has both private and shared accommodation and is sure to give any of its guests memories to last a lifetime! Pippies 3 day, 2 night tour of Fraser Island is the perfect addition to any Australia trip. Pippies offers a immersive way to experience the world's largest sand island with their tag-along camping safari! This tour will give you the chance to drive on the famous island, making your way along its sand highway and inland tracks. You will spend your nights among the Cathedrals on Fraser, where you will sleep side by side with nature and all the beauty that surrounds you! Spend your days exploring all of Fraser's best destinations, including Eli Creek, Maheno Shipwreck, Champagne Pools and even Indian Head! If you want a truly Aussie experience, Pippies 3 day, 2 night tour is for you. This tour will allow you to see and do it all while on Fraser Island, with the added bonus of camping! Get in touch with nature and immerse yourself into one of the most unique islands in the world.